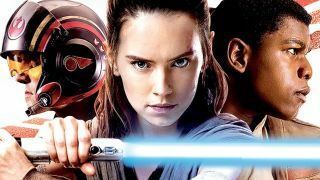 Star Wars: The Last Jedi might have been tip-toeing over revealing well, frankly, anything of real importance from the movie but OF COURSE a random piece of merch may have ruined the opening scene. Read on for more, juicy details. It goes without saying that possible spoilers for Star Wars: The Last Jedi are within. Dutch website Jedi Bibliothek (via Making Star Wars) has stumbled upon a very interesting Star Wars arts-and-crafts book that not only tells you how to create your own A-Wing model, but also features a lengthy description of Poe’s death-defying save to help Resistance HQ on D’Qar escape a swift First Order retaliation. No, I’m not making this up. So, what does that tell us? If it is the opening scene (chronologically, it would make sense to tie up this loose thread straight away), it will follow on immediately after Star Wars: The Force Awakens and will feature a great big space battle. The First Order will also be showing their might with a brutal response to an embarrassing defeat. Star Wars 8’s mantra seems to be go big or go home, which is fine by me.